An example of how a Constructive Narrative Perspective (CNP) can be used to explain the persistence of Post-traumatic Disorder and the treatment implications will be offered. Research implications for using a CNP will be examined. Dr. Glasser will explain that there is such as entity as mental health and will define it in such a way that it is completely separated from what is now called mental illness and collected in the DSM-IV. He believes that by using Choice Theory, clients can be taught how to improve their own mental health. By doing this the medical model is no longer needed and should be replaced by a public health model. The Molecular-Genomic core of therapeutic hypnosis and psychotherapy is identified as the 90-120 minute process that neuroscientists currently term "long term potentiation," which is believed to be the molecular basis of brain plasticity, memory and learning. This will be a review of consequences of trauma, including a diminished sense of identity associated with loss of personal agency. An approach to the rich development of stories of identity will be described. This results in the restoration of personal agency and provides a sense of personal fullness and intimacy. Boundary crossings can be extremely helpful, whereas boundary violations are usually harmful. Therapy is often shortchanged by the tendency to practice defensively. It is imperative not to exploit, disparage, abuse or harass a client. We also must appreciate the significance of confidentiality, integrity, respect and informed consent. All the rest of the ethical rules, codes and regulations are negotiable. Thus, non-sexual dual relationships often can enhance the process and outcome of psychotherapy. Worldwide, societies are crying for assistance in the transformation of their citizens, organizations and institutions. The social artist as cultural therapist offers a new paradigm of sustainable human development, one that supports human development in its most primary form: the development of capacities, skills and potentials that activate the individual and groups in ways that enhance their societal choices and commitments, liberates their inventiveness and raises levels of esteem and cooperation essential to carrying out the goals of making a better world. After a brief description of Family Therapy in the 1960s and an equally brief description of where it is today, we will make a comparison of the success of family therapy in Europe and the shrinkage in the U.S. A new model of family assessment in four easy steps will be described. The Adaptive Information Processing model, which guides EMDR, posits that dysfunctional beliefs, emotions and behaviors are often a direct manifestation of etiological events that have been improperly stored in memory. Implications of the model underscore the obligation of our profession to treat both victims and perpetrators of abuse and violence worldwide. 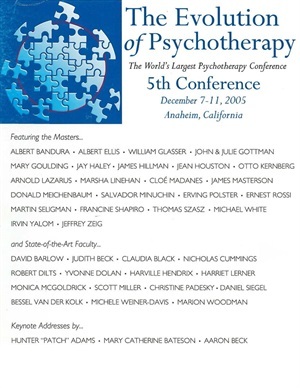 Historically, psychotherapists have worked with individuals, small groups, large groups and organizations. We have moved from treating pathology to facilitating personal growth to expanding public consciousness. A next step is the life-long guidance of congregations of people. With religion as a precedent, and large group formation as an instrument, Dr. Polster will show how we may address the everyday, non-pathological needs of the community at large, spelling out some of these procedures and their theoretical underpinnings. The Gottmans will review research that shows that when the first baby arrives, up to 67% of couples go through a tragic deterioration in the quality of their relationship, which usually begins the cascade toward divorce. Their research outlines the consistent phenomena in this transition, and how the minority of marriages do manage to succeed in avoiding this tragedy. The Gottmans will describe a new approach to the problem and present the results of randomized clinical trial preventative intervention with one-year follow-up data on that intervention.